Let’s face it…winter can do a number on our skin. That’s why I bump up the moisturizers this time of year. Nobody wants dry, dull skin. I’ve gathered up some of the best products to try. So while we all know what makeup look and party dress we love, let’s not forget to do a little party prep on our skin and hair to really shine!!! My essential list for ice cold temperatures are a ultra rich face lotion, gentle facial and body washes, a sweet scent for the tresses, always a good lip scrub to avoid chapped lips, a brightening facial mask, a luxurious bath to keep skin soft & top it all off with an intense body crème to seal the deal. In today’s ring, we only have two contending brands that I adore, especially during Christmas. Philosophy and Lush get it right time & time again. The scents are glorious and even the packaging is so darn cute!! From Philosphy, they have an amazing hydrating & anti-aging face lotion,”Miracle Worker”, that can beat the winter harshness. Now their shampoo/bubbles/body wash combinations & body lotions are heavenly. I like “amazing grace” but they have a ton of scents perfect for the holidays too. Divine!!!!!! Now Lush, my all time favorite for anything, does every holiday right. So naturally, pun intended, they are right on par for Christmas. 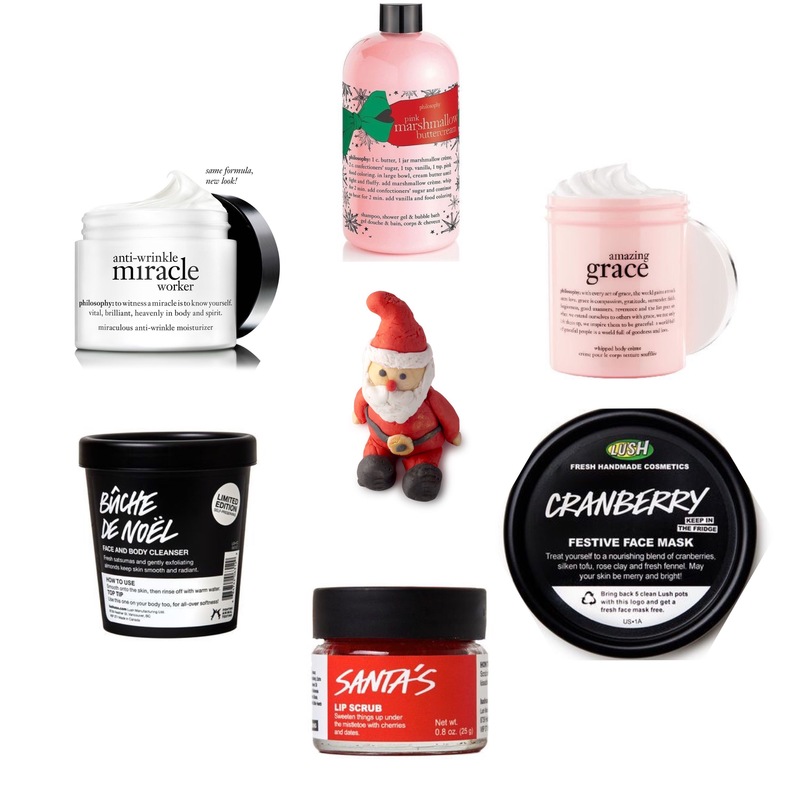 I’m looking forward to the Cranberry Festive Face Mask and Bûche De Noël Face and Body Cleanser I just found. They are always gentle and perfectly balanced to protect nearly anyone’s skin. So don’t forget to share the love with your fellow loved ones. These would make anyone a happy gifted girl. Perfect for stalking stuffers too! Make sure you follow along Pinterest for more great ideas and direct links to buy!! !